This pocket of Provencal perfection inspired Vincent van Gogh through the most productive period of his career, with the beauty of the region, both natural and cultural, captured in more than two hundred of his works. Our route will let you experience your own starry nights in St-Remy-de-Provence, soak up the colours and culture of Arles and explore the glorious Provençal countryside. Soaking up the atmosphere of Arles from one of its charming cafe and the hilltop haven of Baux-de-Provence, with its vast panoramas. Day 1 | Arrive at Nimes, Avignon or Marseille. Transfer to your first hotel in St-Remy-de-Provence. Here you will meet our representative for a welcome meeting and to be provided with your bike. After this, you are free to explore the streets of St-Remy-de-Provence. A good place to start is the Musée Estrine, with exhibits on Van Gogh as well as many other celebrated artists. A gourmet meal in one of our favourite local restaurants is included tonight. Today’s optional round trip takes you out into rural Provence to Eygaliéres, one of the most typically Provençal villages imaginable and a great place to stop and take in some stunning views of the Alpilles. Continuing on, you have the choice of continuing east towards Orgon, another charming village, or turning north towards Molléges for a shorter route back to St-Remy-de-Provence. 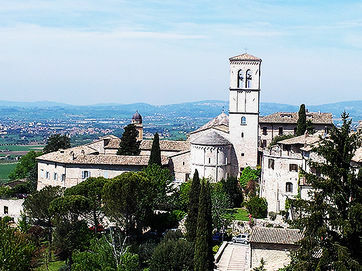 Another optional round trip is available today, looping westwards through the quaint village of Fontvieille before taking you up to the hilltop fortress of Baux-de-Provence. Here, the narrow, cobbled streets are lined with boutiques to browse and the views from the medieval ‘Citadelle des Baux’ are magnificent. A long, leisurely descent takes you back into St-Remy-de-Provence in no time at all. 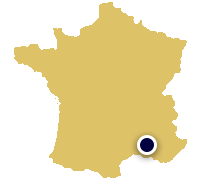 A flat ride today takes you west to meet the Rhône river at the twin towns of Beaucaire and Tarascon. Tarascon’s imposing riverside castle will make it clear that you have arrived. After crossing the river into Beaucaire, soak up the atmosphere with a coffee and a cake in a café next to its harbour. The route continues southwards, following small roads to Arles where a delicious evening meal awaits. 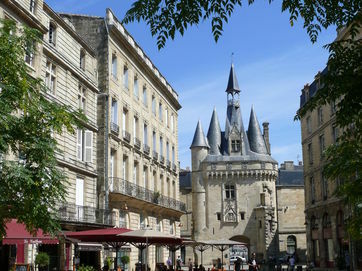 If the sights and sounds of Arles haven’t tempted you into a day exploring the town, why not hop in the saddle, cross from Provence to Languedoc and explore the Gard region. Our route starts by following the route of the Santiago-de-Compostela pilgrimage, past vineyards and cattle ranches. A stop in Saint-Gilles is recommend to recharge your batteries and visit it’s beautiful 12th century church, before a leisurely ride back to Arles. Today’s round trip is one for the wildlife lovers. Head south from Arles, into the Camargue Nature Reserve, which covers Europe’s largest river delta. The wetlands and salt water lagoons here are a haven for a wide range of wildlife, including but not limited to vibrant flamingos from April to September, wild white horses and a whole manner of plant life. Your route will take you to the shores of the Étang de Vaccarès, the largest of the lagoons, before returning to Arles. Pack your binoculars! Today you will return to St-Remy-de-Provence for your final night. The route heads east out of Arles, taking you past Château de Barbegal and winding around the southwestern corner of the Alpilles. A stop in Fontveille to refuel before a flat run back to St-Remy-de-Provence is suggested, although more intrepid cyclists may wish to take the route up and over Baux-de-Provence once again. 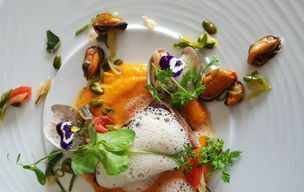 Whichever route you choose, rest assured that another fine dinner awaits in St-Remy-de-Provence. We say “Au revoir” before transferring you directly to Nimes, Avignon or Marseille. 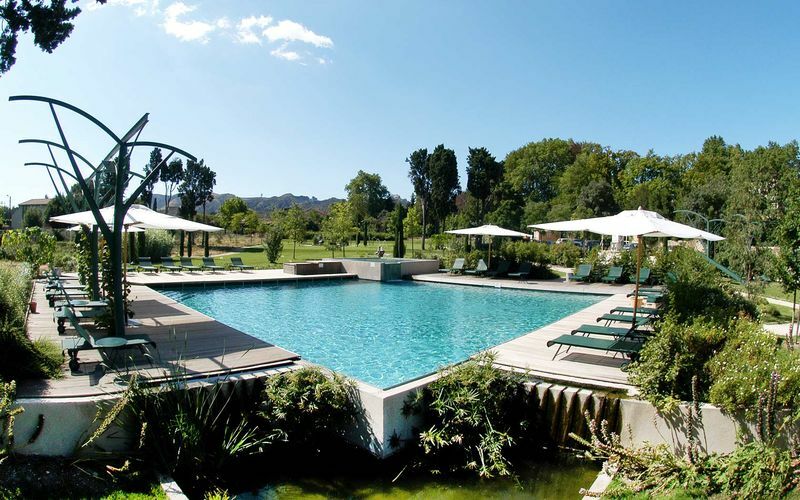 Located just outside the centre of St Rémy de Provence, the Hotel Château des Alpilles is simply magnificent. The hotel is a 19th Century mansion located in a beautiful park with a large swimming pool and the ideal place for a luxurious stay or as a special celebration at the end of your holiday. All the rooms feature a luxury decor combining tradition and modernity. The hotel’s restaurant serves delightful cuisine with typical specialties from Provence. The Hôtel de l’Image, originally an 18th century municipal building has a formal exterior and a stylish, modern interior. Behind the main building there is a lovely garden with a swimming pool and fabulous views of the Alpilles hills in the distance. Walk out the main door, cross the boulevard and you are immediately in the old town. The hotel's restaurant, Les Terrasses de l'Image offers seasonal meals served on the shaded terrace or in the hotel's dining room. 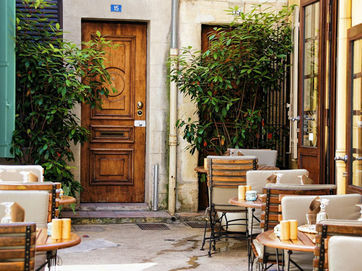 A former convent in the heart of the buzzing town of Arles, the hotel Jules Cesar is home to a range of fantastic rooms and a marvellous gastronomic restaurant. The class throughout is coupled with a funky, modern décor that breathes life and atmosphere into this grand old building. The amphitheatre and ancient theatre are a 5-minute walk away and a host of shops, bars and restaurants are even closer. There is an outdoor pool to cool down in and a picturesque garden area, perfect for unwinding before dinner. A charming 3-star hotel set between the Roman theatre and current amphitheatre. The spa facilities will no doubt seem tempting after a day’s cycling and the peaceful garden is a lovely place for a morning coffee or afternoon glass of wine. 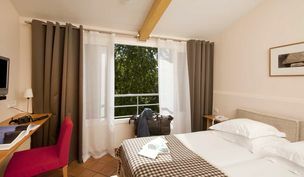 The rooms are decorated in a traditional Provençal style and would not look out of place in a Van Gogh masterpiece, if it wasn’t for all of the modern amenities. Please contact our Activities Experts on 0207 471 7760 for child prices. A predominantly flat route with no significant ascents, using cycle paths and low-traffic roads where possible. Suitable for new cyclists. Like English countryside 50 years ago - car-free, wild flowers, butterflies. 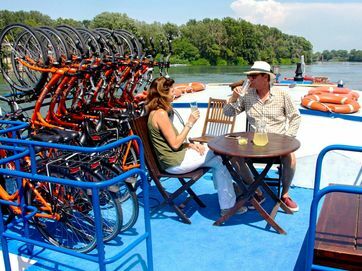 Discover our indulgent collection of cycling tours through the wine regions of France and Italy.